He is one of the most gregarious ocellatus I have ever had. He loves to get out and about in the 75g. While my other ocellatus tend to be much more shy and reclusive, coming out to just eat most of the time, not this guy. And in my experience, ocellatus going to the surface is rare. Mind you that a standard 75g tank is 24″ deep. That might not seem like much, but if you’ve ever kept the smallest of the shellies, you know that they don’t venture up into the water column very often. And going to the surface is almost unheard of. My little guy….he often goes to the surface to get flakes before they ever start to fall. He’s fearless. 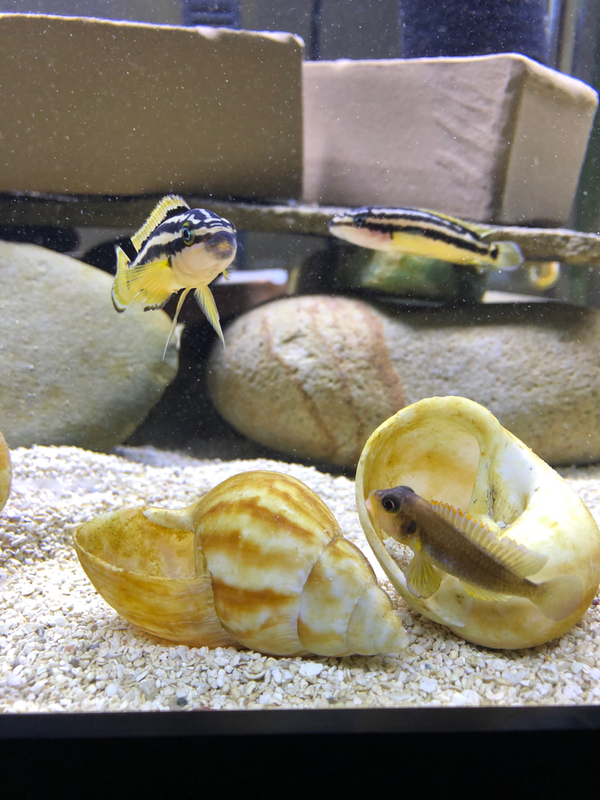 In the photo above, he’s not as agitated with the pair of J. ornatus (though he doesn’t particularly care for them) in front of his shell as he is with the N. cylindricus lurking just to his left (out of the photo). Strangely too, he’s sort of struck up a friendship with the single L. signatus that occupies the same tank. In fact, of the more than two dozen shells spread across the tank, he and the signatus have taken up residence in shells only 6″ apart. The signatus’s shell is just to the left out of frame in the photo above also. He ducked into his shell when the cylindricus came cruising by.